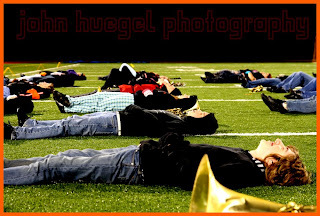 Part of being an excellent marching organization is learning how to relax and focus. One of the benefits of a lit turf field is the opportunity to get horizontal without getting muddy. Here’s an interesting shot of the winds working on some relaxation and breathing exercises. This was a very cold evening, and the stretching and warmups also served to lessen the possibility of injury. This entry was posted in Fall, Marching band by admin. Bookmark the permalink.